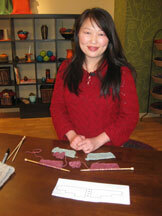 Get all 13 episodes of Knitting Daily TV Series 900 plus 2 bonus knitting and crochet videos! Join host Eunny Jang and experts Kristin Omdahl and Shay Pendray for fun knitting techniques, crochet tips, and more. Make Time for Yarn Every Day with these Must-Have Knitting and Crochet Videos! Take your knitting and crochet further with the new season of Knitting Daily TV, the how-to television series that explores yarns, tips and techniques, and one-of-a-kind patterns for all skill levels. or as a digital download. With the new series of Knitting Daily TV you'll learn how to repair cables, shape short-rows, knit intarsia in the round, and much more. Challenge yourself with ruching and welting design elements, diagonal miters, and unique crochet motifs. Each episode of Knitting Daily TV includes an in-depth look at knitting techniques such as reversible ribbing, Andean colorwork, and steeking, as well as quick tips for fiber artists on attaching I-cord, purling backwards, how to read various charts, and more. Plus, each episode of series 900 also features the new Yarn Spotlight with Clara Parkes that dives into a detailed look at various unique yarns, their characteristics, and their best uses. 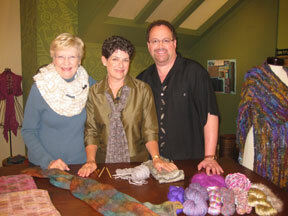 Knitting Daily TV features 13 accessory projects to knit and crochet, including designs by guests Laura Bryant, Barry Klein, and Kristen TenDyke. Knitting Daily TV Series 900 includes all 13 episodes exactly as they appear for Public Television. 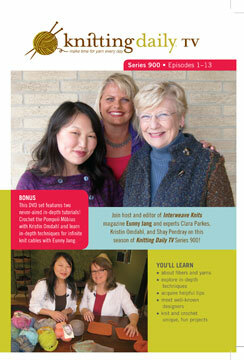 Plus, with the purchase of Knitting Daily TV Series 900 on DVD or as a digital download, you'll also receive 2 never-aired bonus knitting and crochet video tutorials: Learn more about infinite knit cable with Eunny Jang and dive into a crochet mobius design with Kristin Omdahl. Knit and Crochet along with Knitting Daily TV! Visit KnittingDailyTV.com for free crochet and knitting patterns shown on Knitting Daily TV.